February | 2012 | I Haz An Adventure! If you like your caffeine with a view then it doesn’t get any better than the Terrigal Beach Surf Club café. Tucked away on the Central Coast of NSW, this trendy little seaside town has more to offer than great coffee. There’s a vibrant buzz around Terrigal. It’s an interesting mix of holiday makers, Sydney day trippers and locals. Terrigal beach is my Nirvana. Early mornings it’s my sandy spiritual playground; yoga and meditation on the beach, often greeting the breaking day, and basking in the splendour of the sun rising out of the glistening blue Pacific. If you ever want a fresh perspective on the emerging day, try an inverted yoga pose whilst gazing at the ocean, it will literally turn your world upside down. And for the non-yogis out there, an early morning stroll along Terrigal beach is exhilarating. Walking enthusiasts are spoiled for choice here. The beach is lined by a paved esplanade (home to my dear surf club café) which has a regular flow of interesting traffic. In the mornings you’ll see the ‘yummy mummies’ with their BMW prams, designer sunnies reflecting the sparkling ocean, and post-baby bods that don’t really look post-baby at all. After pumping those prams for a while they converge for a caffeine convention at the aforementioned café of my dreams. And then there’s the dog walkers … Terrigal Esplanade is ‘dog-on-a-lead’ friendly, and one of my greatest pleasures is watching pooches of all shapes, sizes, and demeanours, stroll past, enjoying Terrigal with the best of us. The more socially capable canines often join us at the cafe, which is also pooch friendly. They are way cute, unobtrusive, and generally well behaved. Walkers, don’t limit yourselves to The Esplanade. Crank those calves up a notch or two and head over the hill to Terrigal Haven. And indeed it is. Home to the famous Skillion, a steep grassy headland jutting majestically over the sea, the Haven offers breathtaking walking tracks along the headlands and the challenge of scaling the Skillion if you dare. It’s steep, and it will get your heart pounding, but the views from the top are worth it, as is the feeling of being king (or queen) of the world! The temptation to roly-poly back down the hill will no doubt tug at the young (and the young at heart). The Haven also has a small calm beach, and a huge grassy oval, both great places for kids to release some energy and run free in natural open spaces. It is family oriented with several nice BBQs and picnic tables set along the beachfront. The café classes are also catered for here, with two waterfront locations to choose from, plus a new café overlooking the oval. There is a small takeaway outlet where you can have hot chips with the pelicans as they gather by the boat ramp, hoping for a tastier treat from the fisherman returning with their catch. Terrigal Beach hosts several events during the year, including the annual Food and Wine Festival. The Florida Bar at the Crowne Plaza hotel has live music on weekends, a very chilled way to spend your day, and there are sometimes evening beachside drumming circles, complete with fire twirlers and plenty of upbeat African atmosphere. Or perhaps you’d enjoy a more serene tai chi class, which can often be found on top of The Haven overlooking all of Terrigal and the deep blue sea. Seriously, there’s something for everyone here. But back to the café en sea … This is a place to sit, sup, and watch the world go by, with a backdrop of pristine blue ocean and the sea breeze in your hair. A cappuccino connoisseur, I choose the surf club large Soy Cap every time, when I’m not indulging in a sweet, warm, smooth Chai Latte. The menu has changed recently, not for the better in my opinion, but still offers a nice selection of food at standard Terrigal prices. 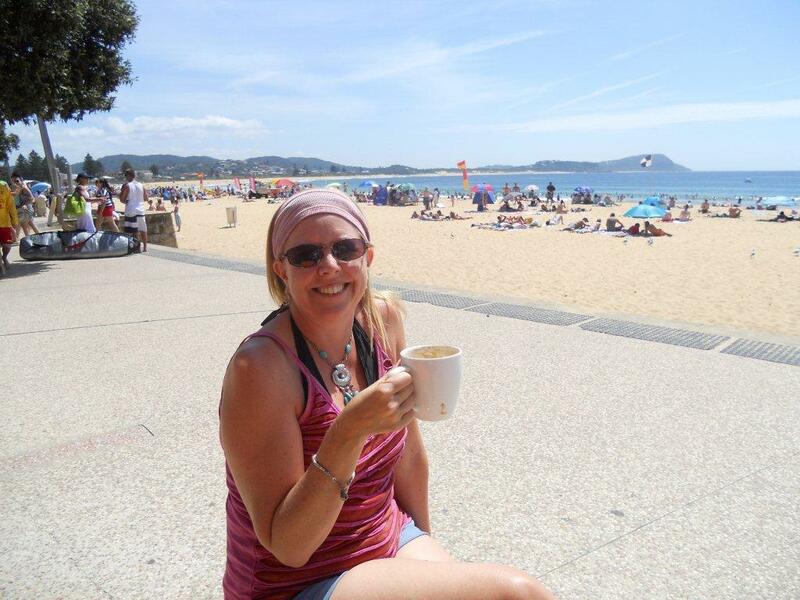 I’m mostly a coffee customer now, as Terrigal hosts a great range of eateries with awesome food. There’s more than one type of surfing happening here, as I café surf myself around town to get the best of everything. Terrigal is a popular tourist destination on the Central Coast, and with good reason, but this means it often gets crowded. My advice is to come mid-week if you can, or arrive early on the weekends to miss the traffic jams and secure your piece of paradise for the day. If you’re after sun, surf, sand, serenity, shopping, or many other activities that don’t start with S, you’re bound to find it at Terrigal. So, with sandy toes and sun-kissed skin, I kick back with my Soy Cap and beachfront vista and watch the world go by; joy in my heart and a huge grin on my face. I have found my bliss.